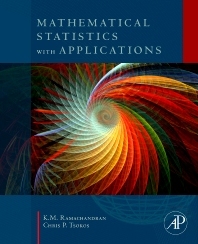 Mathematical Statistics with Applications provides a calculus-based theoretical introduction to mathematical statistics while emphasizing interdisciplinary applications as well as exposure to modern statistical computational and simulation concepts that are not covered in other textbooks. Includes the Jackknife, Bootstrap methods, the EM algorithms and Markov chain Monte Carlo methods. Prior probability or statistics knowledge is not required. Chris P. Tsokos is Distinguished University Professor of Mathematics and Statistics at the University of South Florida. Dr. Tsokos’ research has extended into a variety of areas, including stochastic systems, statistical models, reliability analysis, ecological systems, operations research, time series, Bayesian analysis, and mathematical and statistical modelling of global warming, both parametric and nonparametric survival analysis, among others. He is the author of more than 300 research publications in these areas, including Random Integral Equations with Applications to Life Sciences and Engineering, Probability Distribution: An Introduction to Probability Theory with Applications, Mainstreams of Finite Mathematics with Applications, Probability with the Essential Analysis, Applied Probability Bayesian Statistical Methods with Applications to Reliability, and Mathematical Statistics with Applications, among others.